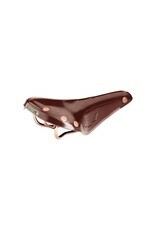 Brooks B17S Special Brown - J.C. Lind Bike Co. The B17 is the oldest saddle design that Brooks England still manufactures (since 1888). This Special model comes with copper plated chromoly steel rails and hammered copper rivets. It makes a nice replacement or upgrade over the stock Brompton black saddle. Leather saddles are more organic and slowly break in over time, eventually (if well-cared for) achieving a "custom fit." The thick leather is also generally more durable than the more common stitched material saddles out there (synthetic or otherwise). 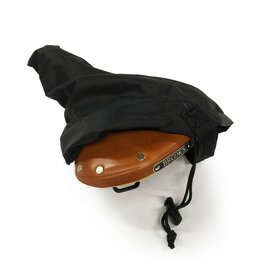 Lastly, since you'll generally be bringing the Brompton in with you everywhere you go, there's no worry about leaving a tempting Brooks saddle where a would-be thief could spot it or where a rainstorm could soak it. And who doesn't want their English bike to have an English saddle, too? When this saddle is chosen at the point of purchase with a Brompton bike in place of the stock Brompton saddle, the price for this Brooks saddle is $105.